There must be a reason why everyone calls it "UKRC Field", right? will prove to be the biggest battle yet. against the protectors of football fields. squatters in a nearby colony and the field is the only space available. football on half or quarter of a field. I wrote that piece 10 years ago, when Selangor was under BN. The story about our fight for the UKRC field was picked up by Jeff Ooi's Screenshots (Rocky takes on Khir Toyo). By 2004, credit to the Menteri Besar who must have seen the light, the Selangor government declared the field as "open space". It was a victory of ordinary people against greedy housing developers, one that would not have been possible without Mr Andrew Gopal and the fearless people of Ulu Kelang Recreation Club. But today, the UKRC is forced to fight for the field again. This time it is up against the Pakatan Rakyat state government, the local council Majlis Perbandaran Ampang Jaya, and the Kuala Ampang Resident Association. The RA was formed only in January this year "to fight for the field". As of Oct 1, the MPAJ has taken charge of the field. A guardhouse at the entrance has been demolished and the residents are "free" to play football in the fields without having to deal with the UKRC. One thing I must say, I disagreed with the UKRC putting up a guard house at the entrance of the field but the MPAJ has guards at the field, too, so what's the difference. And the local council is charging RM200 per game for anyone who wants to use the field, already! Expect another long battle ahead. At least this time there won't be any developer involved. Or is there? Read also The Star's Love labour lost. Dear Rocky, I have been visiting UKRC for the last 10 years and I can tell you that the UKRC Committee is really doing a good job in maintaining the UKRC field and providing recreation for people all over Selangor and not just the Kuala Ampang people. My sons plays football in the UKRC Junior Football Academy. The guardhouse was placed at that time, because the Kuala Ampang RA, mostly made up of gangsters and some UKRC expelled members, started to disturb UKRC activities and doing spins in the cyber world to make believe. I was told that the Kuala Ampang RA sits on a government land togather with a another association that encourages gambling/video games,etc in the association. Will Khalid and Saari Sungib take action and bring the illegal building down? 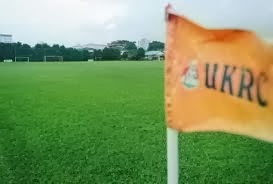 A club that has been managing the field for the past 57 years with millions being spent being robbed in just 2 days by the Pakatan Rakyat government. UKRC should fight it out in Court, if Pakatan Rakyat do not compromise with UKRC. mpaj temberang la! under this current state govt, mpaj has been even worse. applying rules selectively and haphazardly. I have so many stories with them I could write a book. Anak saya berlatih bolasepak di UKRC. Dimaklumkan bahawa UKRC dah mula perbincangan dengan peguam untuk menyaman Khalid dan MPAJ. UKRC dah belanja berjuta-juta ringgit jaga padang. MPAJ dalam 4 hari rampas padang yang dikawal selama 57 tahun oleh UKRC macam tak ada undang-undang di Negeri Selangor bawah Pakatan Rakyat. Hidup UKRC. Lingkup Pakatan Rakyat. Corruption knows no bounds. Here we see MPAJ robbing a club of its rightful playing field. MPAJ should be ashamed of itself. It is supposed to serve the public but in fact is actually working for private greed. They are useless in responding to people's complaints, only good for creating situations for the rakyat to complain about. Let's get rid of these crooks once and for all.